As HR, you often feel like the sole driver of performance and development processes. And while you are responsible for kickstarting a culture of feedback within the organization, your success is entirely dependent on managers and employees embracing and owning it. When employees feel comfortable sharing, asking for, and receiving analysis of their performance, you can expect notable changes in how your company operates. Here are five positive changes you can expect. Feedback is a critical component in improving performance organization-wide and is a two-way street. Not only is it important for managers to regularly provide feedback to their direct reports, but employees should share it with their managers and their peers as well. As the amount of feedback exchanged increases, it provides managers with insights into how their leadership skills, and employees with insights into their work from the people they work most closely with. The result is that everyone is able to reach better decisions, improve performance, and generally succeed in their role. Everyone has a unique set of strengths and developmental areas, making it difficult to apply a “one-size-fits-all” model to professional development. By implementing an easy and structured way to request feedback when it matters most, you are actively putting people in the driver’s seat of their development instead of having to constantly initiate the process. For example, with our most successful users we see that they often take the opportunity to ask for feedback at the end of a big meeting, project or sprint, to ensure they get actionable insights in a timely and contextualized manner. With this shift, people become accustomed to requesting feedback whenever they want or need it, creating a workforce of empowered employees, while also taking pressure off HR. 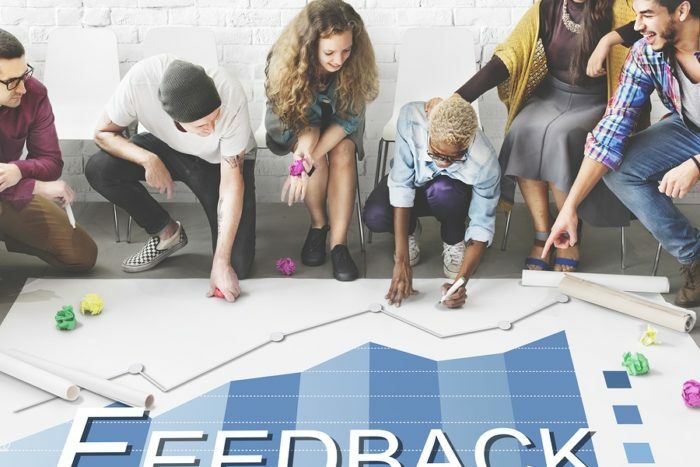 Another benefit of a strong feedback culture, is that it gives employees the tools to address issues before they escalate. When people don’t feel able to share feedback with one another even on the smaller things, over time they can transform into larger issues. On the other hand, when people are used to regularly sharing feedback, they become more comfortable with having these difficult conversations. This means they won’t feel anxious about asking their co-workers to speak lower when on the phone, or to be more consistent with having their part of a project completed on time. Getting into the habit of sharing feedback means they are better equipped to address any kind of situation rather than bottling it up. There is a strong correlation between feedback exchange and employee engagement. Not only because of its potential to resolve issues quickly and increase knowledge sharing, but also because it creates a way for team and individual successes to be recognized more regularly. Remember feedback isn’t just about development, it’s also an opportunity to celebrate wins big and small. Understandably, when people feel valued and recognized for their efforts they feel motivated and engaged. In fact, 72% of employees in a recent survey ranked recognition as having the greatest impact on engagement. According to PwC, nearly 60% of employees surveyed stated that they would like feedback on a daily or weekly basis — a number that increased to 72% for employees under age 30. There are many reasons as to why people don’t get the feedback they are looking for: it’s time consuming, stressful to give constructive feedback, and in the beginning it’s not easy. However by focusing on building an employee-driven feedback culture, you can break down some of these barriers. Supported technology, developing the correct training, and creating resources, you can create a process where people can freely exchange feedback with anyone within the organization.